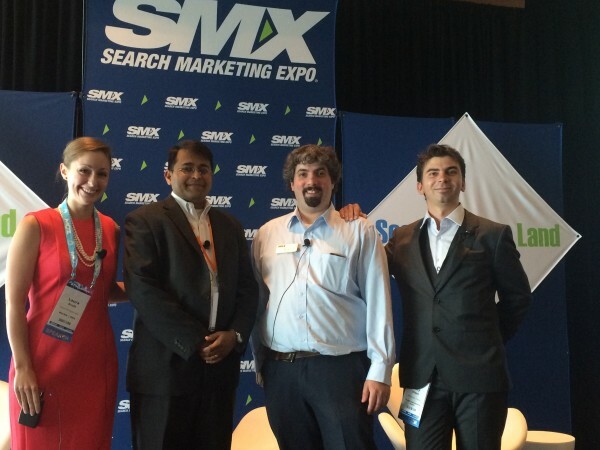 This is a real-time report from SMX Advanced 2015. April 21, 2015 arrived with a bang. Google announced it was the day that mobile-friendliness would officially be a ranking signal for Google mobile search results. That day, dubbed “Mobilegeddon,” wasn’t the the day search marketing changed, however. Improving a website’s experience for mobile users has been an SEO mission a long time in the making. SMX Advanced speakers, including a Google representative, share thoughts on improving a site in light of Google’s mobile-friendly update. “Ten years ago we (Google) noticed that mobile would become a huge thing.” 52 percent of US smartphone users use their phone to do product research before buying things. 40 percent of UK online sales take place on a smartphone or tablet. People sit in front of the TV more than they’re on their phones. Those who have a smartphone are usually just young people. Most young people use phones for social media and entertainment. Mobile devices are difficult to type on; the screen is tiny and purchasing anything is a nightmare. Plus, you can’t trust things you can only see on a small screen. This is the year where the number of mobile searches exceed desktop searches in many countries. People watch more videos on smartphones than PCs and tablets combined. 30% of UK consumers look at their smartphones within five minutes of waking. Nomophobia: the fear of being without a mobile device. 66% of commercial purchases are made on the mobile web. 5% uptick in the mobile friendliness since Feb. 26, 2015. Mobile is still the new black. A quality mobile experience is super important for web users — all numbers show that. If you start looking at people on the subway, they are doing all sorts of things. People, in fact, are investing in cutting-edge devices so they can better access mobile technology. Why Am I Not Mobile-Friendly? When you don’t configure the viewport, we can’t label you mobile-friendly. Font size is important. You need to be able to read the content. You shouldn’t ignore the rise of mobile. Internet penetration means that we are getting more and more smart phone devices. In 2015 Google had more smart phones activated than the two previous years. Mobile has changed so much – it went from a phone that connected us to our friends and family to a device that connects us to … everything. The Feb. 26 announcement galvanized the industry to take action. Google made us jump from one level of evolution to the next as an industry. It made us look at what we should already have been doing: building better search experiences for the users. Build your sites for users. It’s time to redefine SEO. Search engine optimization emphasizes the wrong thing. Let’s call it search experience optimization. Conversion rates on mobile are 50% lower than desktop — let’s focus on improving. See what Googlebot-Mobile sees with Fetch as Google. What might you focus on next when it comes to mobile? We are looking into interstitials. There are several sites, including Search Engine Land, that throw interstitials that I can’t for my life, close. I think interstitials will be the next thing. How accurate is the mobile usability report in the Search Console? It’s pretty damn accurate. It’s using the same specification that we use in rankings. It’s very, very close to 100 percent. Do you foresee mobile search indexes being separate? We are looking into whether or not we can do that. We are still working on that. It’s a huge change. And it’s nothing that would happen tomorrow. People don’t link to mobile URLs, for example — if people don’t link to mobile URLs, we can’t use Page Rank. So this might not happen? It might not happen. But I do hope we can move to a stage where we (can’t look at each separately). What is the major mobile trends you see other than the rise of searches? Video. I travel a lot and I like looking at what people are doing on their mobile phones. In Singapore, there is way better Internet than in the U.S. On the subway I was looking at what people are doing — they’re watching videos or listening to videos. In Sydney, surprise, they’re also watching videos. In Melbourne, they’re watching videos. In California, guess what — they were watching videos. The next big thing will have something to do with mobile video. There are lots of opportunities there. Some sites that aren’t mobile-friendly still rank highly even when their competitors are mobile friendly (like Full Tilt Poker for example). What’s that about? At SMX West 2015, someone asked if navigational queries would be affected. Back then I couldn’t answer directly, but now I can: navigational queries are protected. If we know that a URL is ex navigational for a query, we do want to show that on a user’s radar. If you search for Barry’s cats, let’s say, and we know that rustybrick/cats is super relevant for that query, we still want to show it even if it’s not mobile-friendly. If the content on a mobile page is lengthy, is it considered good practice to hide content? Do you plan on pre-announcing future? I would love to. Announcing the mobile-friendly update was awesome — I really loved how transparent we could be and how much we could communicate things updates. We have a few changes that we could talk about, probably not as transparently, but my personal ultimate goal is to become super transparent about our big launches. We might, for example, do some changes for hacked sites. It’s pretty obvious for people what hacked means. Yes of-course everybody needs a mobile friendly website and using google webmaster tools one can fetch the website and could check whether each and every page of the website is mobile optimized or not.